Organic crème fraîche from Riverford Dairy in Devon. Tangy and velvet-smooth, made with milk and cream from pasture-fed dairy cows. We’re sure all that organic veg the cows enjoy adds an extra something to the depth of flavour. Use in tart fillings, pasta sauces, dips and in puddings. Good in place of custard to contrast with a sweet pudding, or scooped on top of a bowl of fresh fruit. 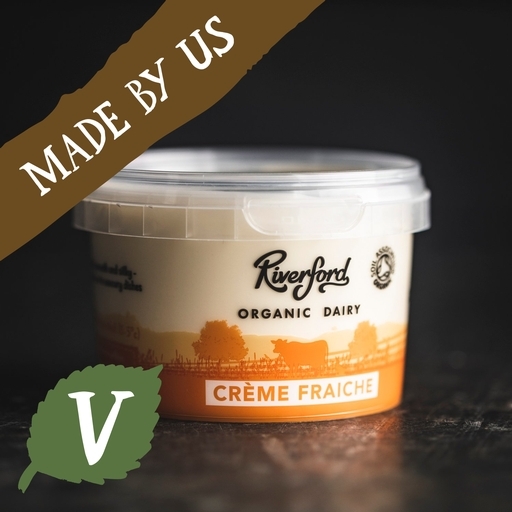 Our crème fraîche is made at the Riverford Dairy. We mess about with our milk as little as possible. The cows are milked every day and the milk is pasteurised. Pasteurised double cream, pasteurised milk, culture.